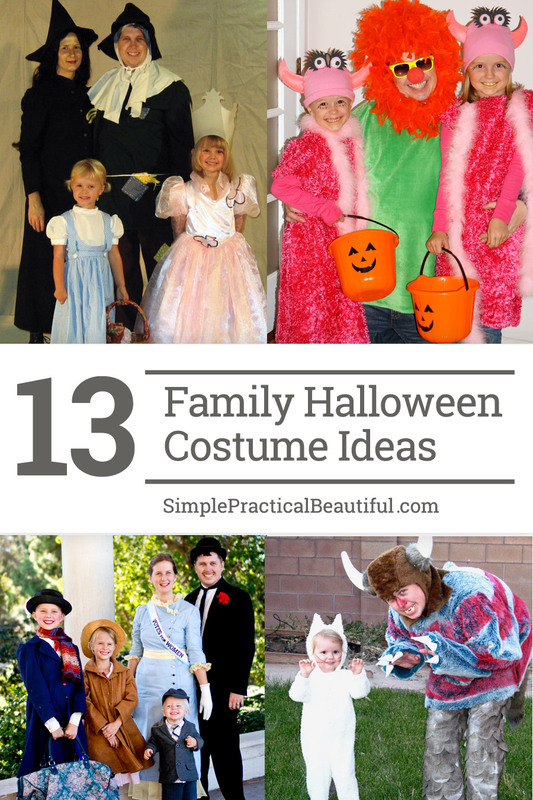 Make Halloween a family holiday by dressing up together with themed family costumes. 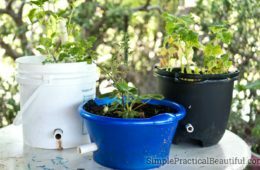 Here’s some ideas that our family has used. Our family loves to have a theme to our Halloween costumes every year. We have since my husband and I were dating. So today I’d like to share some of those costumes with you. 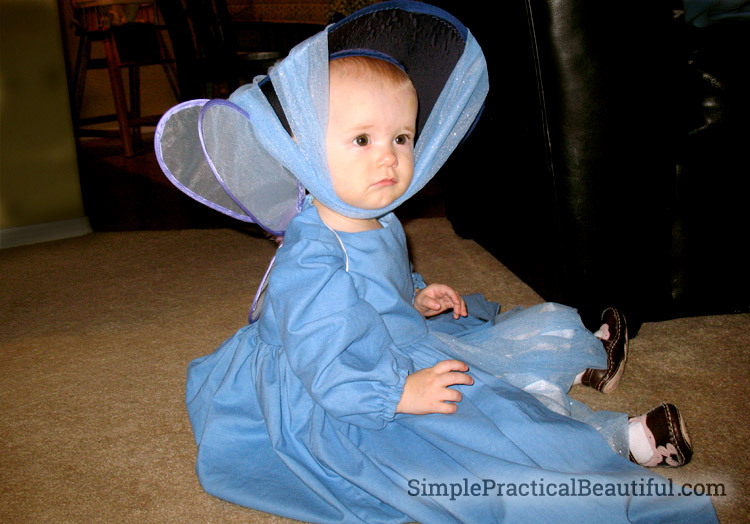 Hopefully they will inspire you and get you excited about dressing up for Halloween this year. Some years our costumes have been very intense with a lot of sewing. And some years our costumes have been pretty easy, using mostly what we already had. Almost every year involved at least one trip to the thrift stores, though. But if you’re planning to find thrift parts for a costume, don’t wait until October to go look. There isn’t much left for costumes by then. Most of these pictures are snapshots taken the night of Halloween, so they are not great photographs. A couple are even pre-digital pictures that I had to scan. 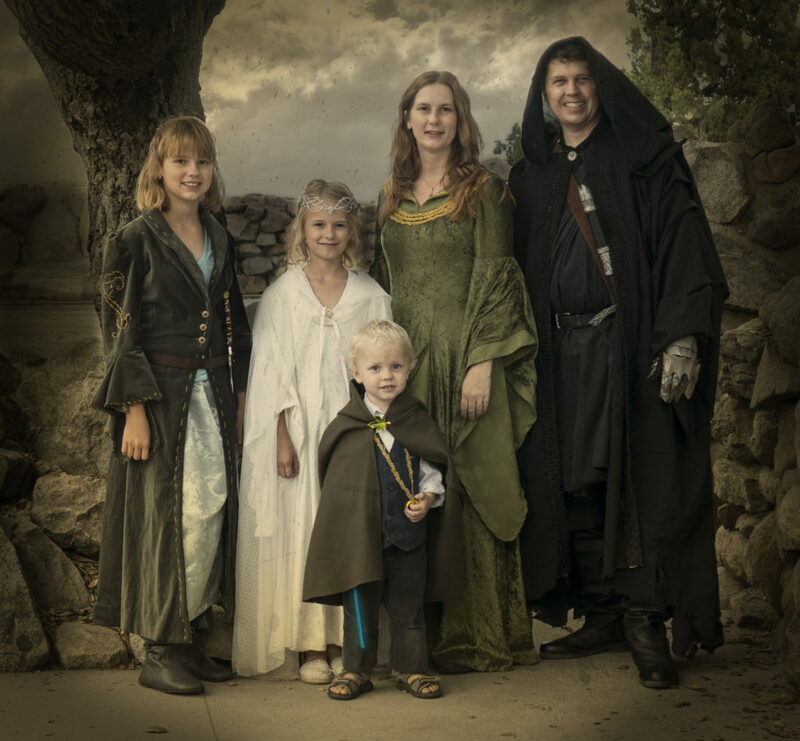 It wasn’t until very recently that we’ve tried to get good pictures of our family costumes. 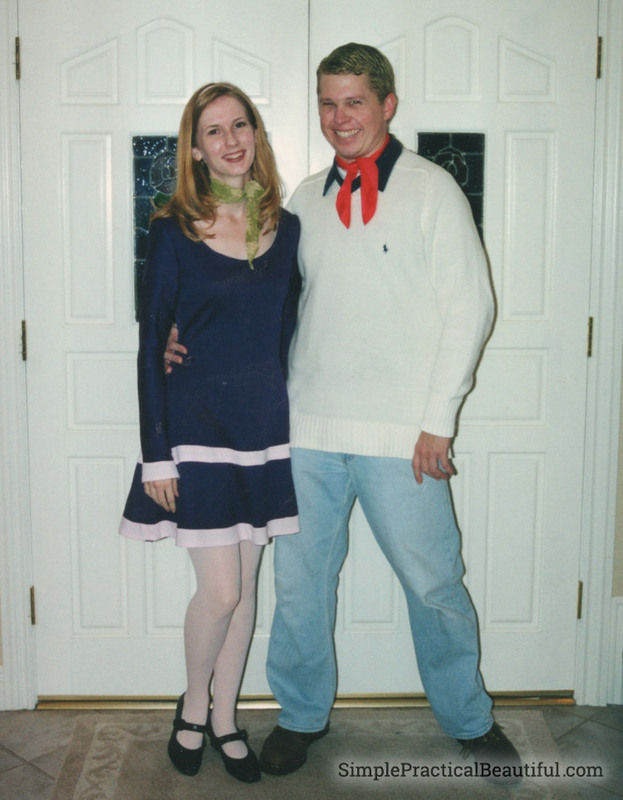 I knew he was the one, when my husband (boyfriend at the time) became the Fred to my Daphne. We both grew up watching Scooby Doo, and I think we were both pretty thrilled to find we had found another creative, and crazy, soul to dress up for Halloween. 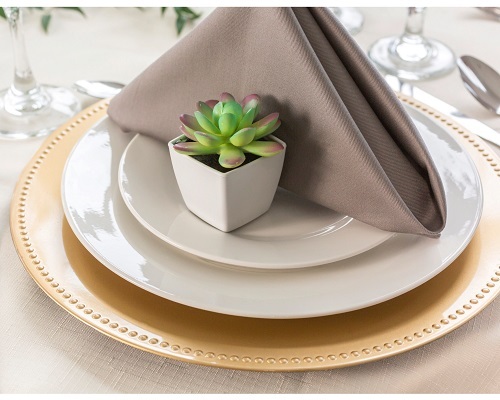 So, of course, once we were married, we went all out. We dressed up as characters from the Disneyland ride Pirates of the Caribbean. The ride, not the movie. 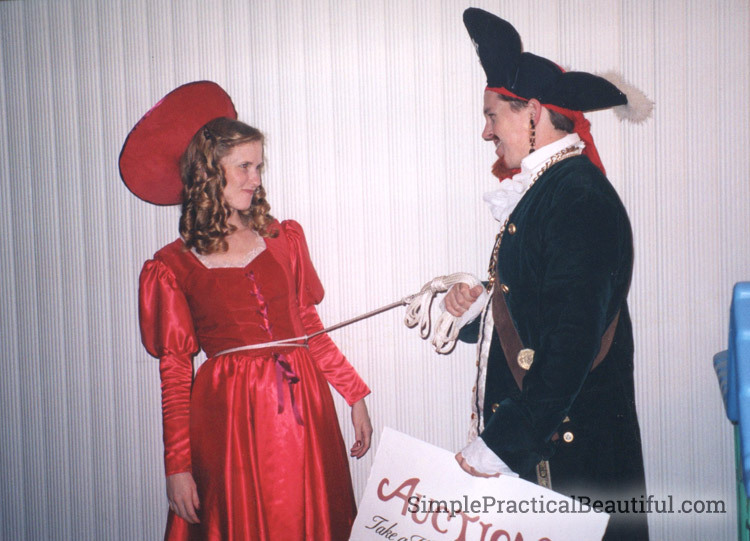 He was the auctioneer pirate, and I was the redhead next up to be auctioned off. If you’ve been on the ride, I’m sure you recognize them. The best part of the costume was the realistic-looking beard I gave him using the skills I learned during my days in stage make-up. It was a cool beard, but hard to get off. Our next family costume included our 6-month-old baby. Her costume needed to be comfortable and sleepable. So I made her a sheep costume. 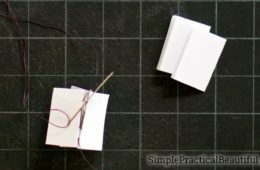 I found lots of patterns for making animal costumes in baby sizes. 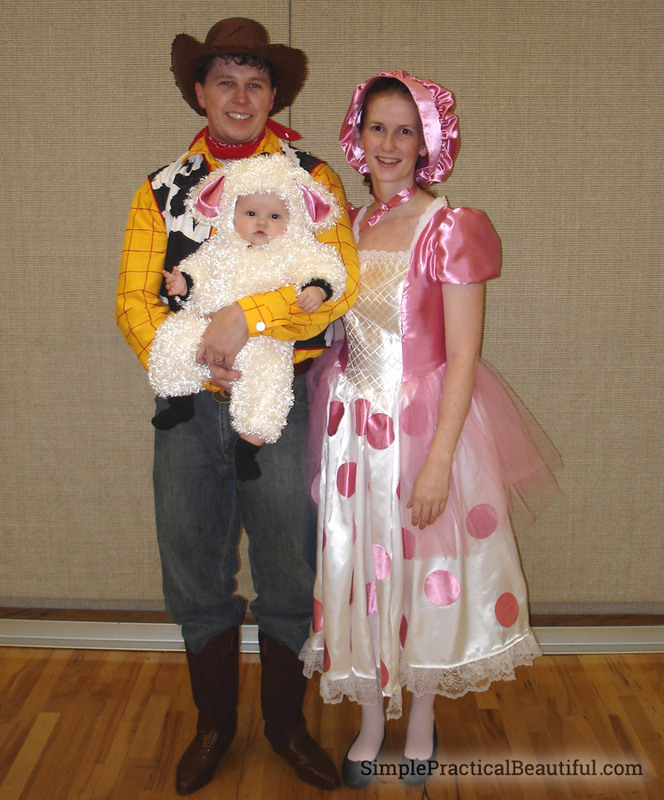 My husband and I were the characters Woody and Bo Peep from the movie Toy Story. 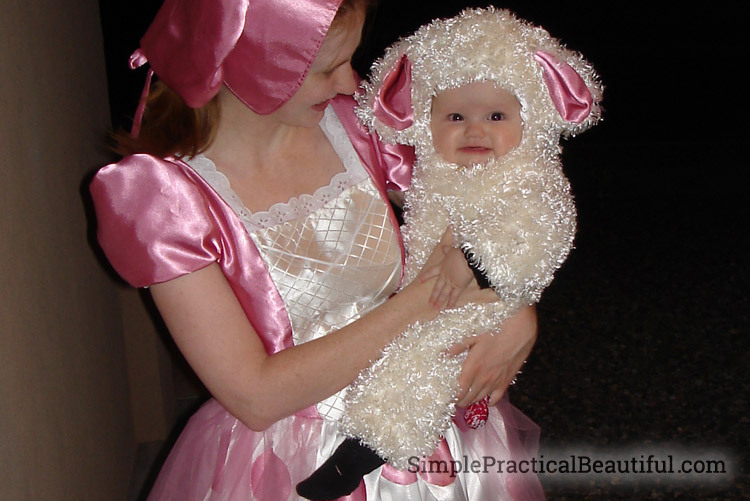 The baby was my sheep. 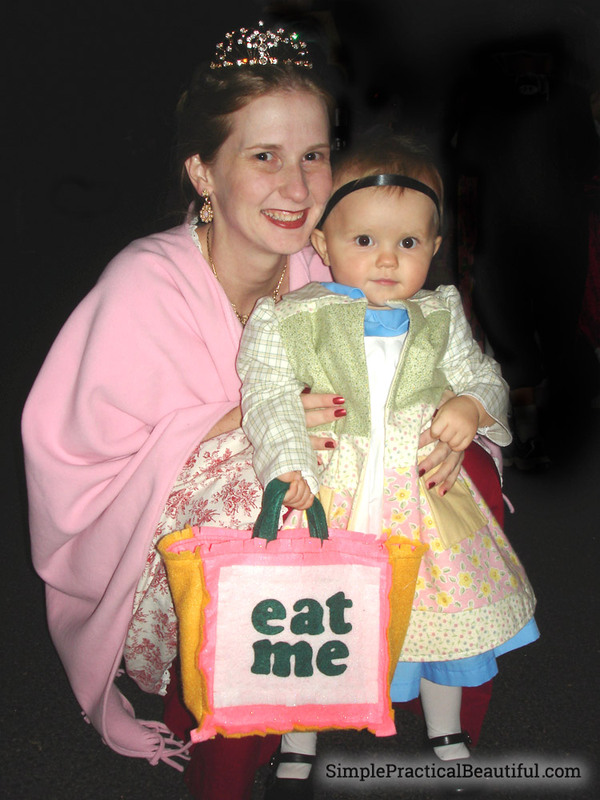 Now that we had a little girl, dressing up as characters from Alice in Wonderland seemed perfect. 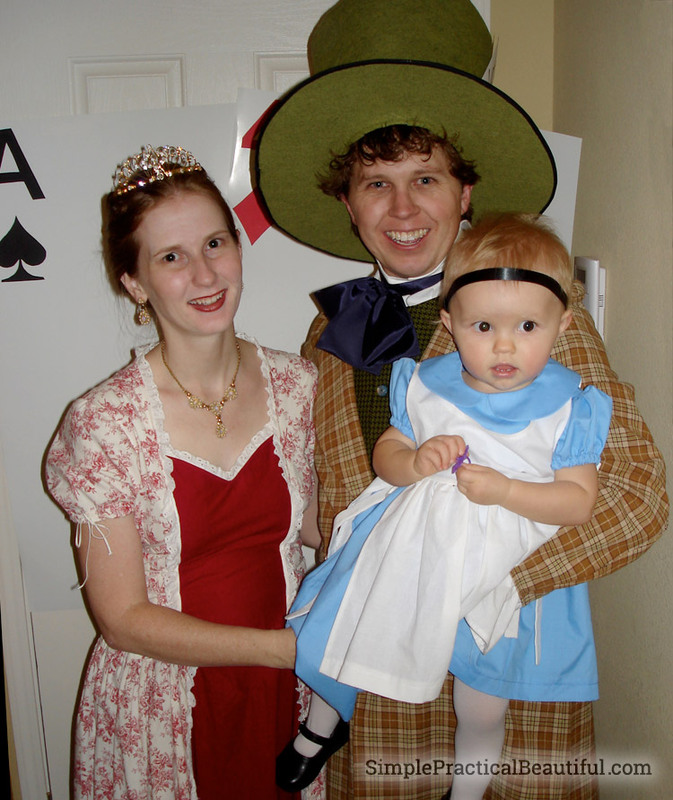 My daughter was Alice, and my husband was the Mad Hatter. I borrowed a red dress from my sister and went as the Queen of Hearts. 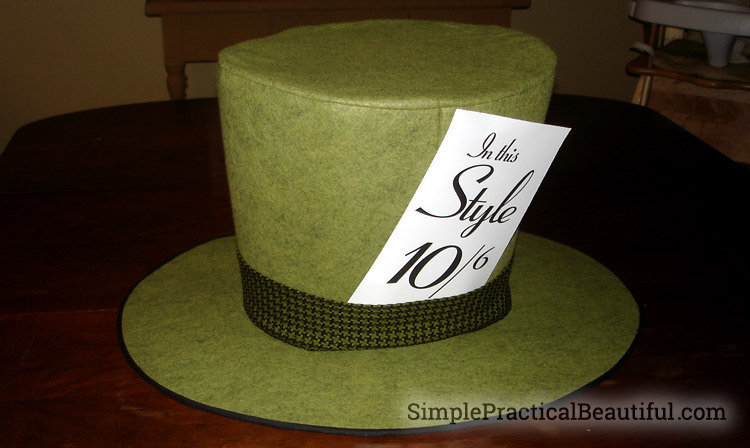 The hat for the Mad Hatter costume turned out really cool. 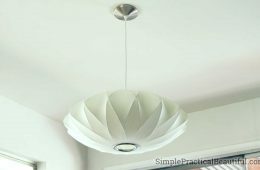 I found a pattern from Simplicity that had a hat. 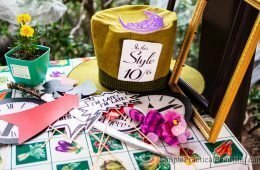 It wasn’t too hard to enlarge the pattern to make the Mad Hatter’s over-sized hat. I even made a patchwork coat for my Alice in Wonderland so she wouldn’t be too cold in her short-sleeved dress while trick-or-treating. My younger daughter was born just a week before Halloween. 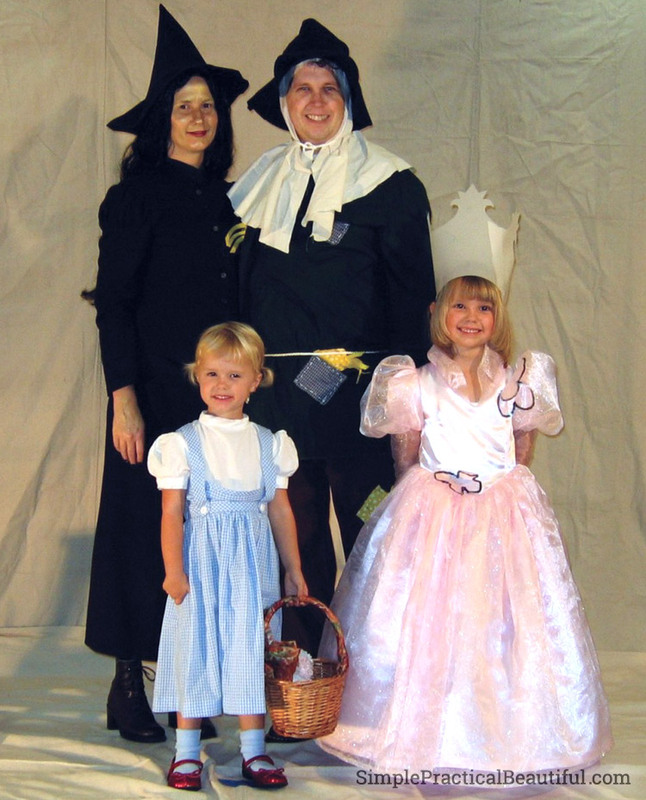 So that year my husband and older daughter were the only ones to dress up. 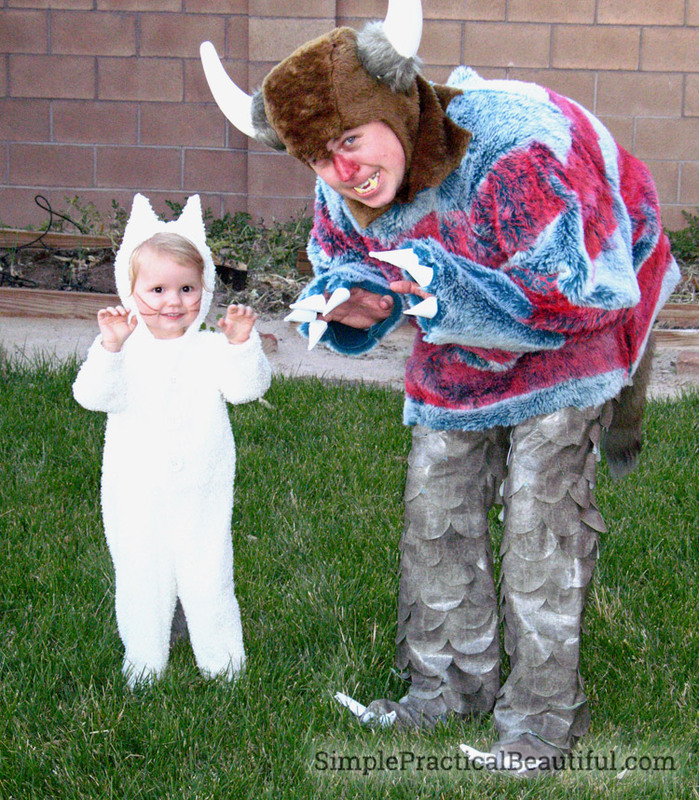 They dress as Max and a wild thing from our family’s favorite picture book, Where the Wild Things Are. The wild thing hood is actually a plastic viking hat covered in fur. 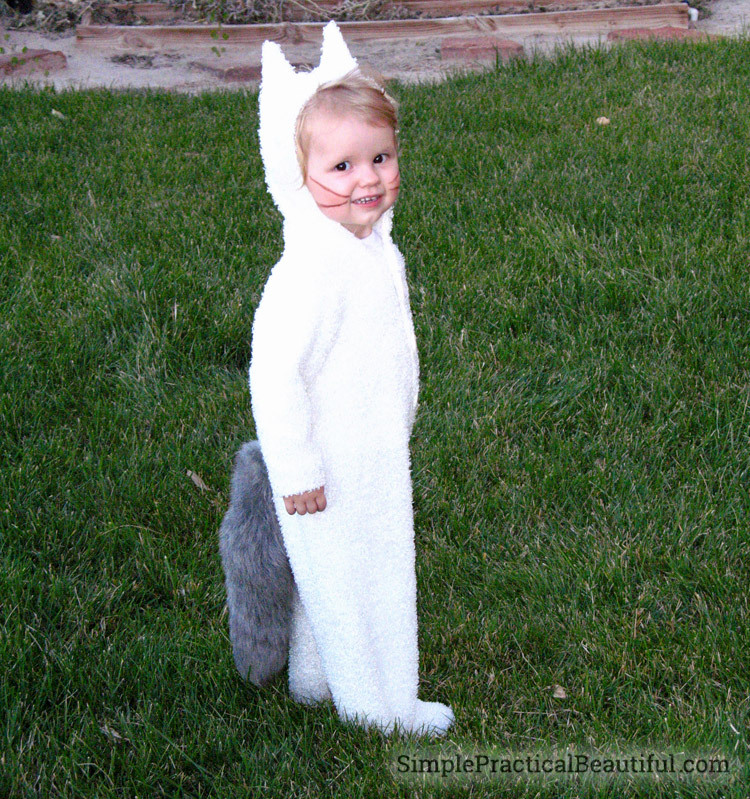 The best part of my cute daughter’s Max suit is the fuzzy gray tail. 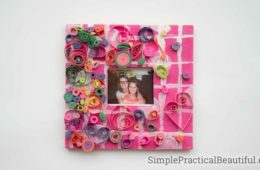 The next few year our lives seemed to revolve around all things pink and princess, and not just at Halloween. 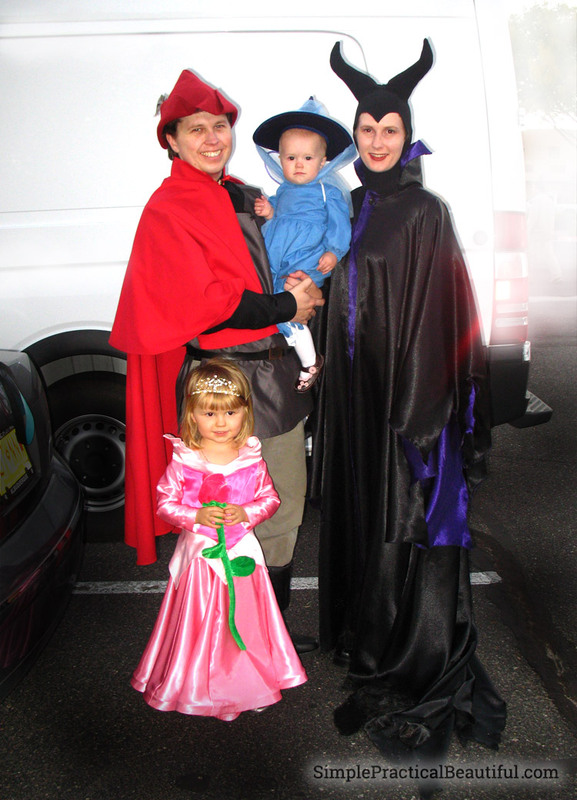 It was my daughter’s dream come true to be Aurora from Sleeping Beauty with her dad as the handsome prince. My younger daughter made the most adorable Merryweather. She even kept her hat on most of the night. Merryweather is my favorite character in the movie. Well, except Maleficent. With two toddler, PBS kids shows were popular in our house. My daughter wanted to be a princess again, and Super Why happened to be one of her favorite shows. It has a princess and four main characters. 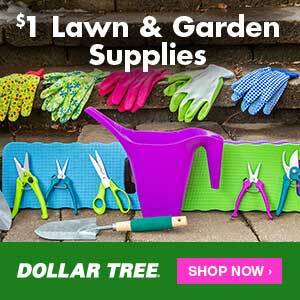 Perfect for our family costume. 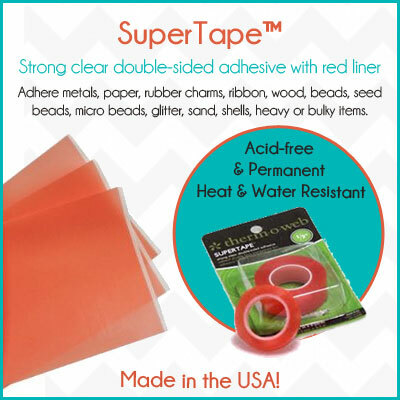 My husband and I were Super Why and Wonder Red. 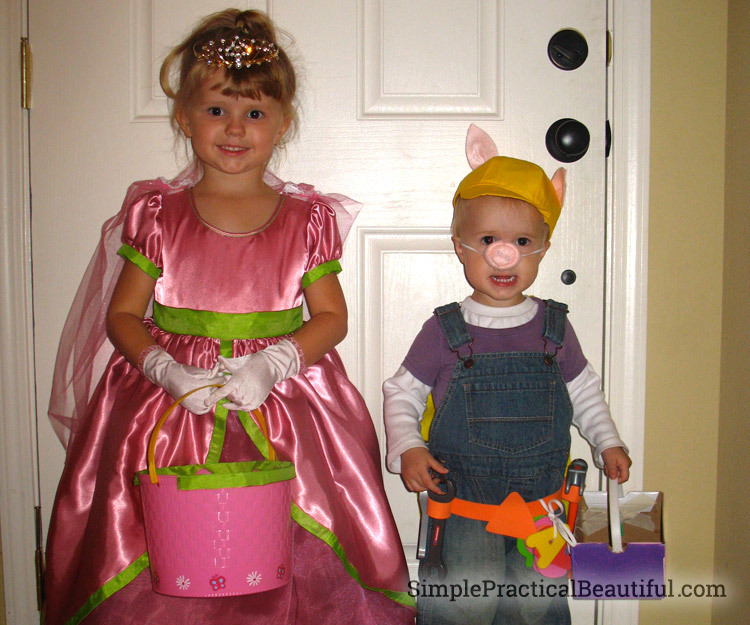 My daughters were Princess Pea and Alpha Pig. Isn’t she just the cutest little pig? Her tool box doubles as her candy bucket. 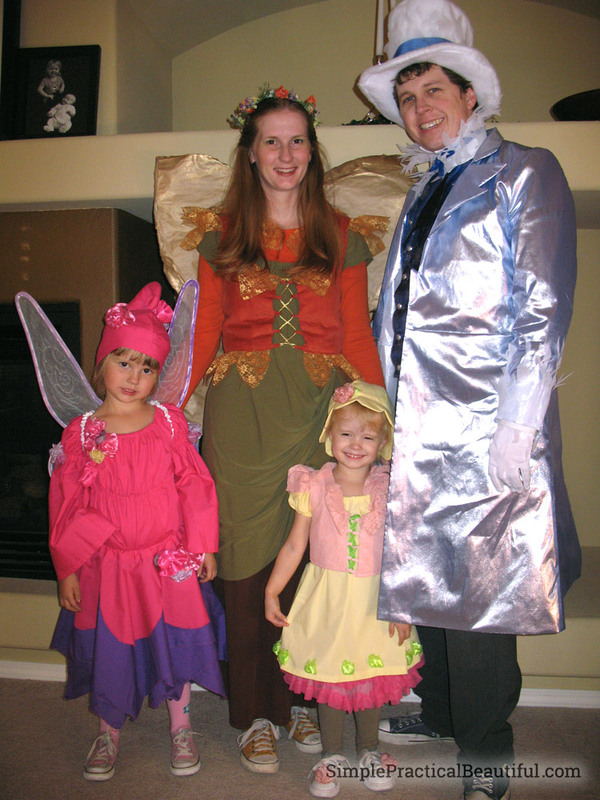 The princess obsession changed to a fairy obsession, so we all dressed in fairy costumes the next year for Halloween. The youngest was a spring fairy, the older daughter a summer fairy. I was autumn. And my husband dressed as Jack Frost for winter. Those were fun costumes to make because I got to design everything. It was the first year we weren’t characters from a movie, book, or ride. We just had to spend the evening explaining to every person we met what we were dressed as. 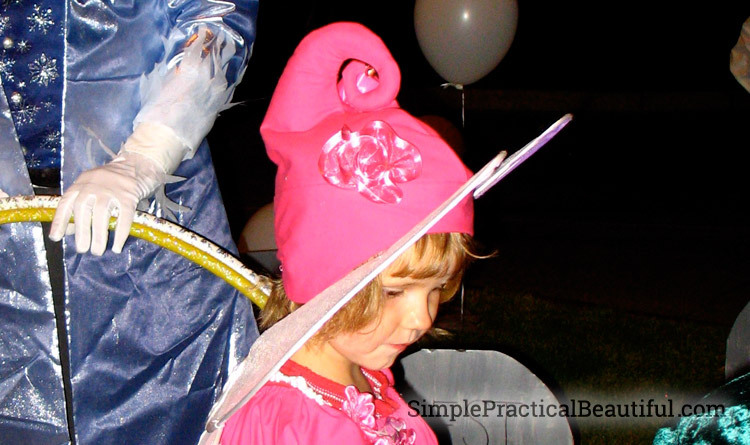 My favorite part of these costumes is the pink fairy hat. It makes the cutest curly-Q on top. I loved how it turned out. The next year we went back to well know characters. 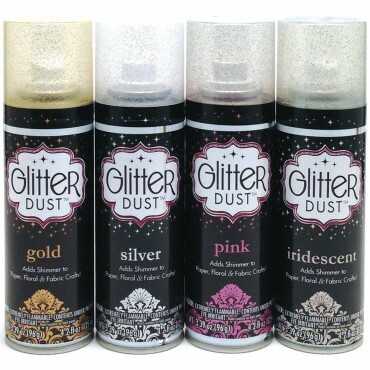 Our daughters were Dorothy and Glinda. Dorothy even collected candy in a basket with Todo, her stuffed dog. My husband and I had recently seen Wicked, so we were Elphaba and the scarecrow from the play. 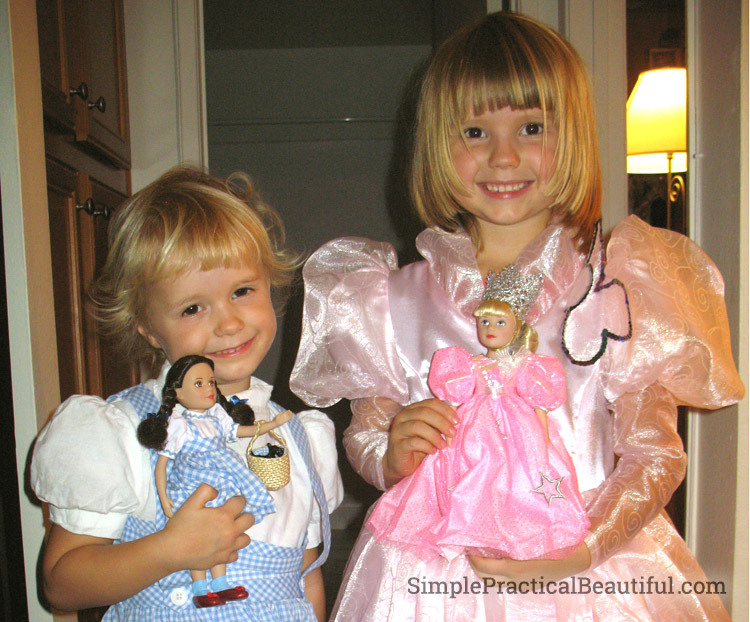 My daughters got dolls to match their costumes that year. 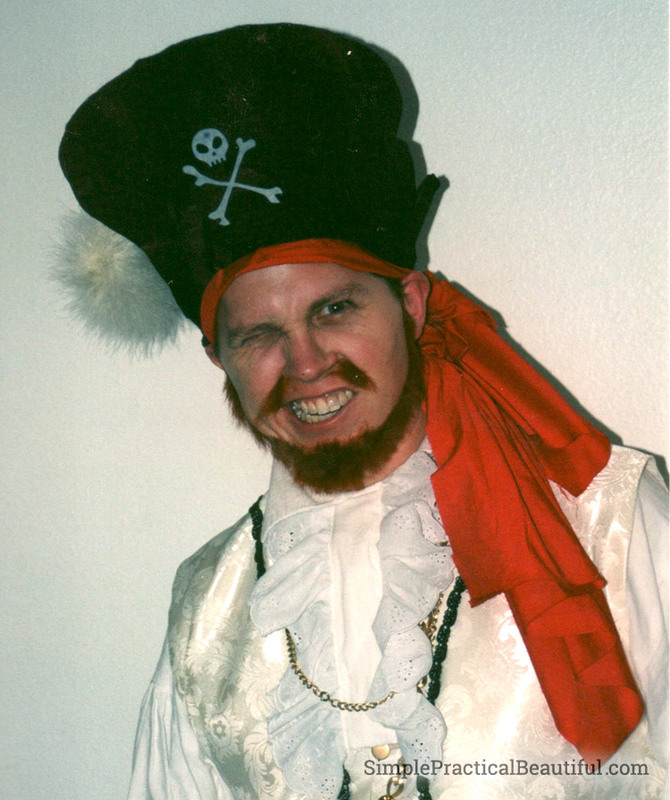 We moved into our house a week before Halloween, so that year my husband and I recycled our pirate costumes instead of making new ones. We’re not even in the family picture. My daughter followed the sea theme, and wore mermaid costumes. 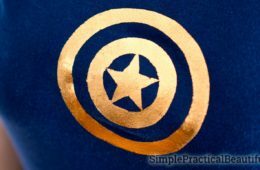 The costumes aren’t patterned after any characters. We went to a fabric store, and they picked out the most mermaid-like fabric they could find. 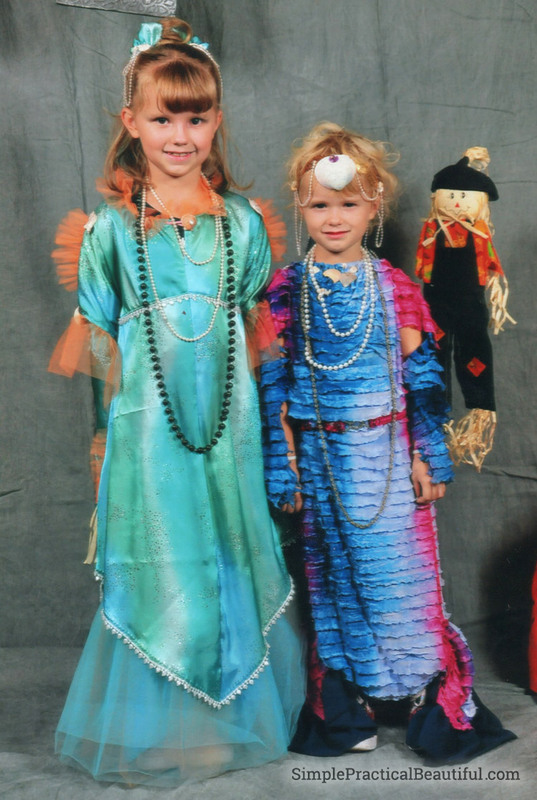 Then I used that fabric to make mermaid dresses for them. And I refused to have my daughters wear shells for their tops, so I got creative. In a skit from the very first episode of the Muppet Show, a crazy orange and green muppet sings “mahna mahna” while two tall, skinny pink muppets sing “do do do do do.” It’s a hilarious skit that you should see if you haven’t already. 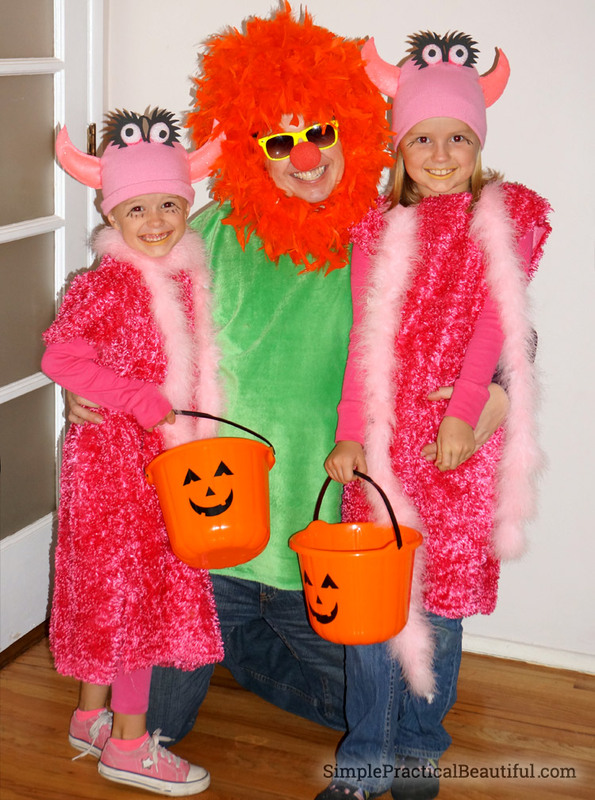 The year I was on bed rest for my pregnancy, my husband and daughters dress up as the characters from that skit. The girls even had yellow lip stick. 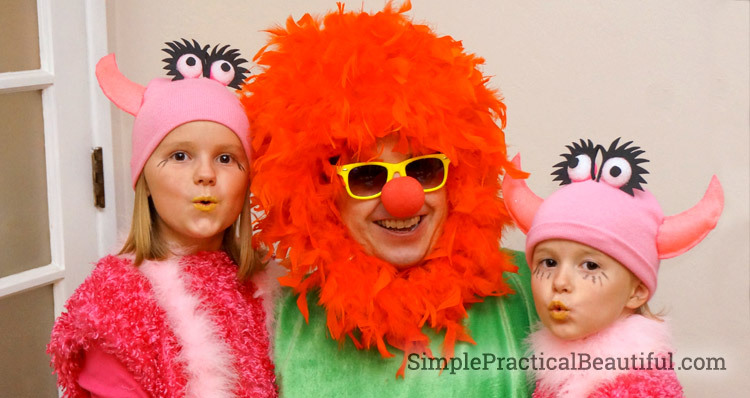 The orange wig is an orange feather boa sewn on a knit cap. I wrote three posts about these costumes and how we made them last year. 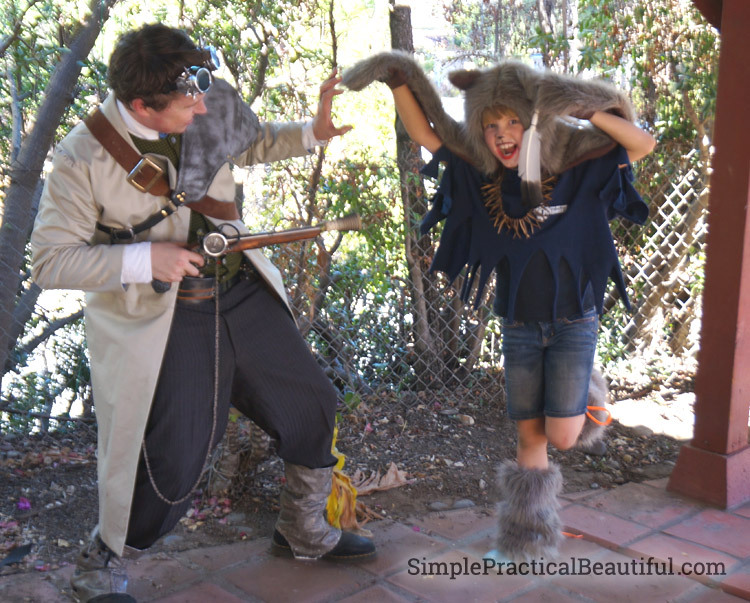 Go take a look at the Gentlemen’s Steampunk Costume, the Women’s Steampunk Costume, and the kid’s Monster Costumes. 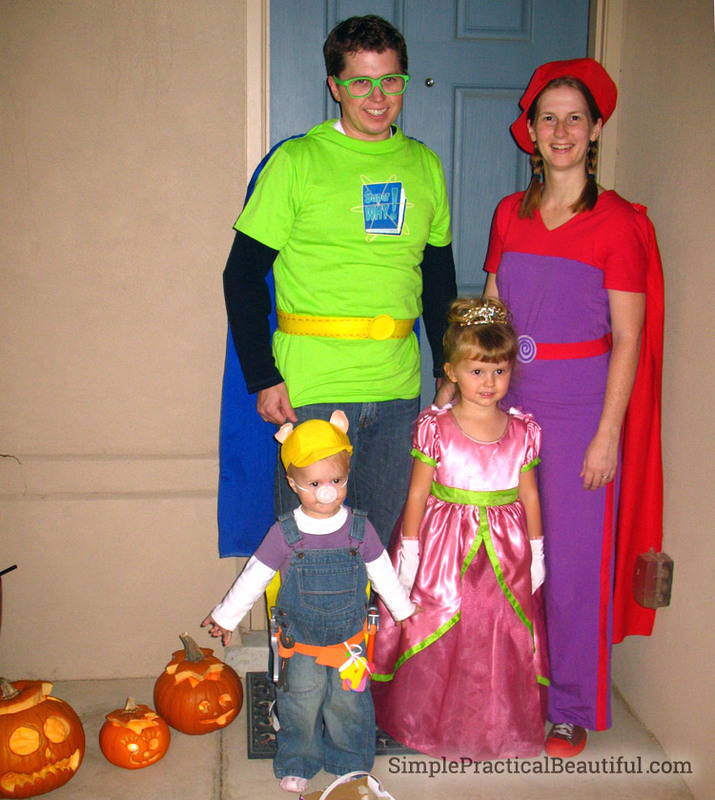 Since our daughters were older, we had so much fun making these costumes as a family. It felt like we just kept adding more and more details. So fun. 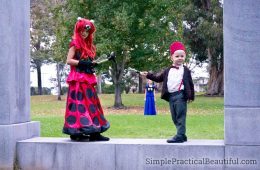 You can read posts about our Mary Poppins Family Costume and how we Altered the Patterns to make a couple of the costumes. 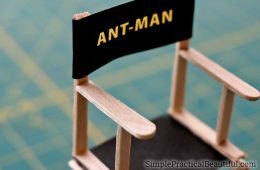 It was fun to try to get the costumes to look as close as we could to the characters in the movie. The details in The Lord of the Rings movies are amazing, so it was a lot of fun to research how to get all of the details of our costumes right. You can see all of the costumes in my post about our Lord of the Rings Costumes. 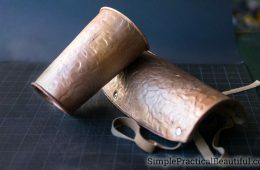 But there’s also a post about the Nazgul Sword and the Nazgul Gauntlets because there’s so many things to tell you about making them. If you have any questions about how we made any of these costumes, please ask in the comments below. 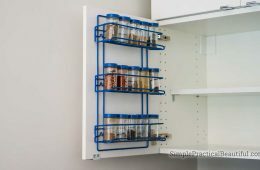 I would be happy to share pattern numbers and supplies we used to make all of them. 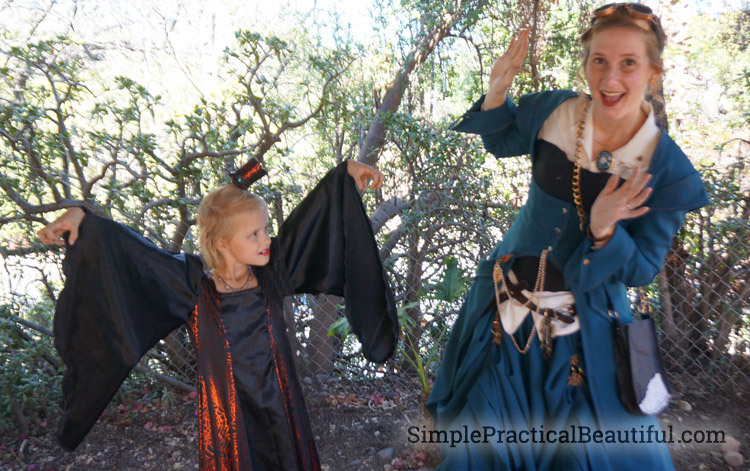 This post would just be too long if I explained how to make every costume in it, but I would love to tell you! Rebecca you are the best! 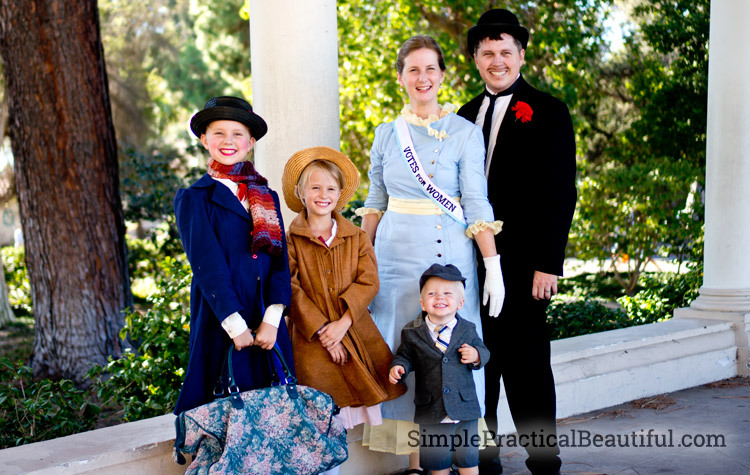 What a wonderful tradition to have the whole family get into the act and all dress up. All all your choices are very age appropriate too. 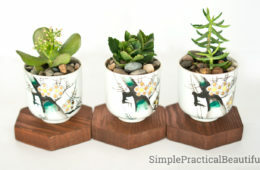 Love your imagination and creativity ! 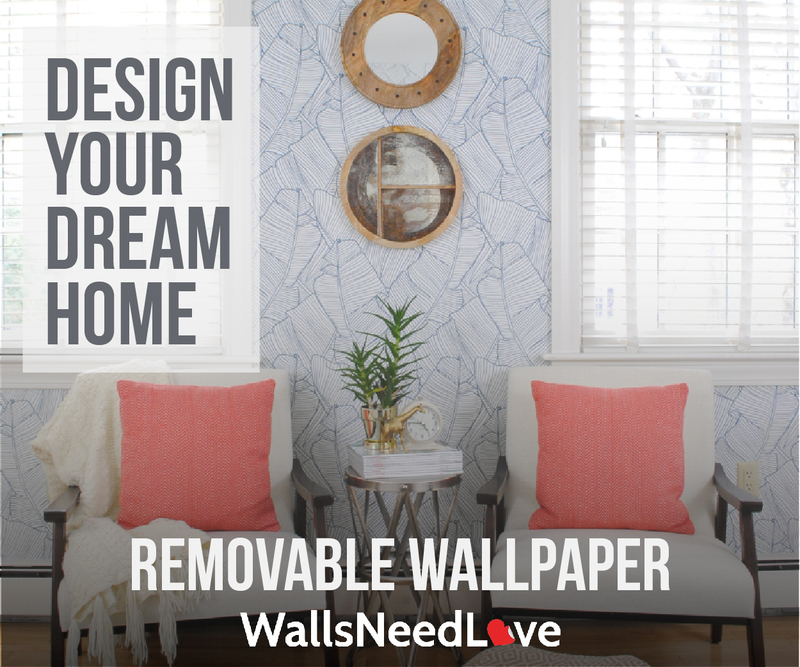 Sharing this! Happy Halloween!